Louis-César-Victor-Maurice de Broglie, known as Maurice, was a distinguished physicist who made many contributions to the study of X-rays. He was a member of a Piedmontese royal family which has been significant in both the world of science and the history of France. In 1740, Louis XIV had confered the hereditary title of duc on the head of the family. Maurice also led his younger brother, Louis-Victor Pierre Raymond de Broglie, into a career in science. Of the two, Louis now remains the better known for his idea of the wave properties of electrons (1923). On 27 Apr 1875, Maurice was born in Paris. The distinguished de Broglie family had supplied France with several generations of soldiers, diplomats, and politicians. Accordingly, Maurice became an officer in the French navy (1895-1908), where he he had a brilliant career in the technical aspects of the service. Of particular interest, he installed the first wireless radio on a French warship. Maurice took his licence at Marsailles in 1900. "Science is an old lady, content with the attentions of old men." However, he was able to begin working in the laboratory of the distinguished theorist Paul Langevin. Maurice presented a thesis to the University of Paris on Brownian motion. (Einstein also chose to write on this subject in his thesis of 1905). Maurice earned his Ph.D. at the College de France, writing a thesis on ionic mobilities, in 1908. It was in this same year, 1908, that Maurice built an extensive private laboratory in his family mansion on rue Châteaubriand and became the French scientist to work with X-ray diffraction. Through these experiments he invented x-ray spectroscopy using his "method of the rotating crystal." He turned a single crystal on a vertical axis at 2 degrees per hour, by mounting it upon the on the clockwork mechanism of a recording barometer. Throughout this rotation of the crystal, information on the x-ray energies was recorded on a photographic plate for all angles between the incident beam and the diffraction planes. The x-ray line spectrum thus produced showed sharp and diffuse lines and bands. In particular, two of the absorption bands proved to be the K edges of silver and bromine in the photographic emulsion. This was the first observation of an absorption edge (de Broglie, 1913), though some further experiments were required to correctly interpret the absorption edges. Meanwhile, in England, a young physicist, H.G.J. Moseley, was also working to determine the X-ray spectra of the elements. Whereas Maurice style made exhaustive careful measurements of the spectrum of one element at a time, Moseley quickly surveyed many elements. 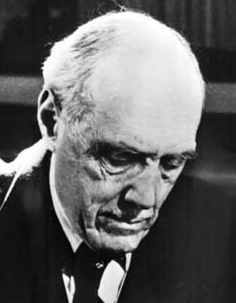 Across the wider range of information Moseley produced, certain consistencies supported the controversial, new model of the atom presented by Niels Bohr. Following the outbreak of World War I, both saw action. Moseley died in the battle of Gallipoli. Although Maurice survived, during the war years, his work had been superseded by Sweden scientists (whose country was neutral in WW I). After the war, Maurice continued working on X-ray diffraction and X-ray spectroscopy at the laboratory in his home where he brought together a large group of young scientists. These co-workers, who made major contributions, included Alexandre Dauvillier, Louis Leprince-Ringuet, Jean Thibaud, and Jean-Jacques Trillat. 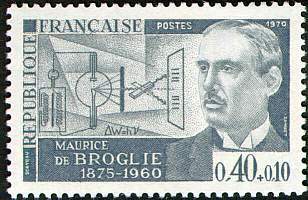 Maurice thus set a precedent of scientific work in the de Broglie family, which was followed by his younger brother, Louis (born in 1892, seventeen years after Maurice). Louis had intended to study history like his grandfather, Jacques. However, during WW I, he studied as a radio operator in the navy and his interests turned to physics under Maurice's influence, and the brothers did some research together. They soon published a paper on x-ray spectroscopy together (M. et L. de Broglie, 1921). By 1923, Louis published initial ideas on the wave properties of electrons in a brief paper of his own. The next year, Louis presented the subject as his thesis at the Sorbonne, so far ahead of the science that the faculty didn't know what to make of his dissertation without comments invited from Einstein. Maurice continued his own scientific research and did further pioneer work in nuclear physics and cosmic radiation. The De Broglie Model, History of Physics Timeline, C3P, Dept. of Physics, University of Dallas. The EXAFS Family Tree: A Personal History of the Development of Extended X-Ray Absorption Fine Structure, by Farrel W. Lytle. Œuvres de Maurice de Broglie, a list of publications by M. De Broglie. Concise Dictionary of Scientific Biography, by American Society of Learned Societies (Charles Scribner's Sons, 1981). The Cambridge Dictionary of Scientists by David, Ian, John and Margaret Millar (Cambridge University Press, 1996).